Softbound: 79 pages; .25" x 8.65" x 6.65"
Wolfgang Schmidt, a well-known German herpetologist, was one of the first people to introduce a well-developed basic chameleon book, first published in German and later English. The book, complete with color photographs, was well received in a time when very little was available on chameleons in print. It is still a good book for someone exploring the possibility of having a chameleon as a possible pet and understanding the basic needs the new owner will have for their care. 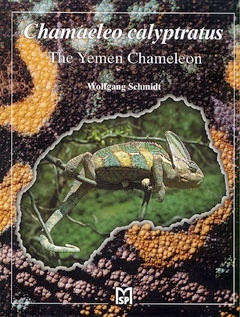 Like his first book originally published in German, so was this book Chamaeleo calyptratus-The Yemen chameleon (commonly known as a Veiled Chameleon in US). There is nothing lost in the translation, the book is rich in photographs and tables as well as offering a multitude of background information on the species. The book covers systemmatics, distribution and habitats, physiology, behavior, age expectations, coloration, purchasing considerations, breeding, egg incubation, rearing of neonates and related problems, housing, the housing issue of cohabitation, diet, and even diseases! Well, that is a lot of information to be crammed into 79 pages, especially considering the fact that almost every page has a photograph on it too! One of the more unique sections in the book is on "Color as a substitute for vocalization". There are color diagrams showing coloration variations and zones of color of calyptratus with two tables indicating how the interpretation was determined. Ten different "moods" are pictured and have corresponding interpretations. Some very interesting stuff! The sections on breeding, incubation and rearing of the neonates are well thought out and deal with the concerns for the process in an informed and insightful manner. The pictures of a female digging and depositing her eggs in the sand through the side of a glass nesting container is a very unique view and offer the reader an opportunity to see something most of us have never seen. The thing that really pleased me was to see Mr. Schmidt share with the reader the natural habitat of C.calyptratus. This seems to be a lost part of the understanding of our captive husbandry for this species. Four pages of text and photos bring a new and better understanding to the reader of how and where this chameleon lives. Overall the information is concise and the data provided is a great resource for further research for the die-hard chameleophiles. If I was going to find fault with the book at all I would say it is that the references to supplementation are all for German based products and the reference to using a drinking bowl as a source of water. This book offers the reader an excellent look at Chamaeleo calyptratus, where it came from, what it needs and what to expect. Once again I'd say Mr. Schmidt has a winner. If you have C.calyptratus or plan to get one, get this book, it is well worth the price! For: $ 26.50 ea. Plus $3.50 shipping & handling.